Microsoft has started to roll out Files On-Demand for Mac, a function of Office 2019 that allows users to see all of their files held in OneDrive storage from the Mac desktop, with documents downloaded from the cloud only when they are required. Initially announced in September, the Files On-Demand feature is now being rolled out as a full feature. According to Microsoft's product roadmap for Files On-Demand for macOS Mojave, the status has been updated to "Rolling out" as of Thursday, and is being provided to Mac users of OneDrive for Business. It is unclear how long it will take before all OneDrive for Business customers will gain access to the function, nor if it will be made available to non-business subscribers of Microsoft's Office 365 suite anytime soon. It will be made available as part of the regular OneDrive sync client, reports Thurrott. Files On-Demand allows users the ability to navigate their OneDrive cloud storage through their computer's existing file management system, which for the Mac is Finder. 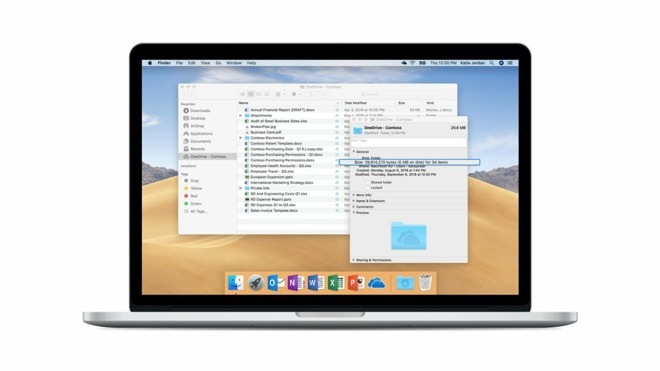 The OneDrive storage appears as an APFS-formatted volume in macOS Mojave, as if they are kept locally, but in fact users see placeholder versions of files that take minimal space on the Mac. On needing to access a file, OneDrive downloads it to the Mac and replaces the placeholder. In theory, Files On-Demand will save users with constrained local storage capacity from wasting too much on files that are not always needed. While files that are frequently required can be kept on the local drive, the less-used versions will still seem to be available to users, but instead are stored in the cloud for later retrieval.